Inspired by true events, taking place in the Netherlands from 17th to 19th January. Ah, Eurosonic. One of Europe’s premiere showcase events is a daunting, if exhilarating experience, due to sheer size and scope, especially if you’re used to more boutique showcases. There’s no exclusion here; you can find German deathcore bands rubbing shoulders with Portuguese singer-songwriters, Balkan labels downing shots with Slovakian music export offices, and Slovenian reporters working for European media drinking way too much beer and doing god knows what. Anyways, with over 40.000 visitors, more than 4.000 professionals and 350+ acts spread across more than 50 venues, not including all the unofficial off-events, accompanying programme and afterparties, going to Eurosonic is like choosing your own musical adventure. Navigating between gigs, clubs, meetings, coffee shops, restaurants, bars, random run-ins and new acquaintances, no two people have the same experience at the festival, which makes it that much more unique. Here’s the adventure Europavox chose, courtesy of one stalwart Slovenian journalist and his courageous Portuguese sidekick (his comments in light blue). Following an early flight to Amsterdam, we were carted off to Groningen, about two hours away by bus. Here’s the thing about Groningen – it’s small and charming, with lovely streets and old Dutch buildings, and it appears to embrace ESNS wholeheartedly. Unlike with many other such festivals, which seem to exist in a pocket outside of everyday city life, the townsfolk seem to be content with plastering ESNS posters all over town, organising their own bar shows, and greeting the influx of sooner or later highly inebriated foreigners warmly. Between their hospitality and the many familiar faces around town, getting into the festival mood is no hard task, and it wasn’t long before we were happily swigging beer and listening to one of the highlights of the first day, Binkbeats. 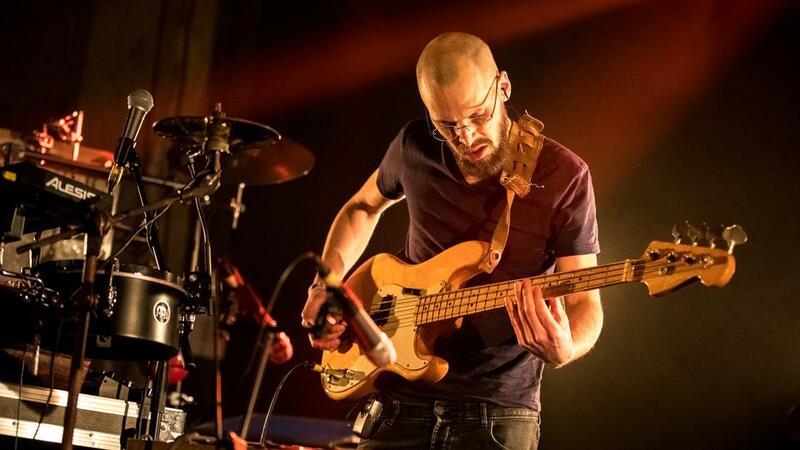 The Dutch multi-instrumentalist is remarkable not just for the fact that he started out by doing live covers of electronic acts such as Aphex Twin, then progressed to his own original material, but for the incredible array of instruments he surrounds himself with. We counted around 25 different sound-producing devices at one point, from drums to guitar, from xylophone to chimes to a small TV set thingie, and he probably had more stowed away somewhere. Oh, and he sings as well, though honestly, that seemed the weakest link in an otherwise impressive chain of carefully constructed electronic structures, danceable yet non-invasive. The further one moves into the center of Europe, the harder it is to resist the charming of new and untasted beer. Still, I needed to make sure that I remembered as much as possible and therefore exercised great caution in making another round to the bar. It worked, kinda. Watching the same Binkbeats concert felt like something that could come out of an anxious nightmare. Let me explain: he performs surrounded by so many instruments that he makes your regular one-man band look like a boring affair. Manoeuvring with precision through his laboratory, he composes a completely new soundscape for each song. Getting to watch him live feels like watching a man walking on a wire, while your hairs stand on end, hoping that he doesn’t slip. And, like a true master, he never does. Just a flight of stairs away, in the upper Grand Theatre hall, Slovenian pianist Bowrain and his trio later treated a packed auditorium to their melodic compositions. The rewarding sight of a hushed audience, enraptured by the music, underscored the importance of events such as ESNS in getting the word out and allowing locally established artists the chance to reach a broader audience. Of course, some make more of that chance than others. Danish band Iceage failed to meet admittedly high expectations, with their discordant post-punk falling flat among a rapidly dwindling audience in Groningen’s famed club Vera. They simply didn’t click live, seeming detached from both the crowd and the music. 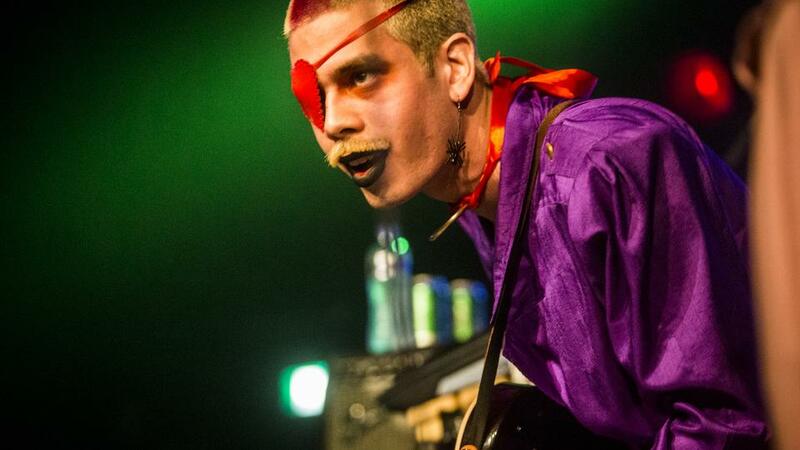 Thankfully, later that night, WARMDÜSCHER, part Fat White Family and part Paranoid London, performed their dirty, scuzzed out, slightly demented spontaneity to much greater effect. Another miss greets us the next night when we head to the outer ring of venues. It’s just 15 or 20 minutes away from the central cluster of clubs, but like in previous years, it seems to be a bit too far away to draw the random curious onlookers that cruise around downtown. It’s not enough to just get to ESNS – getting the right venue can play a major part in the show’s success, as well. Hyped Spanish electronic artist Museless didn’t fare well at the Simplon club, her looped experimentation a bit too mundane to really pique the meagre crowd’s interest. 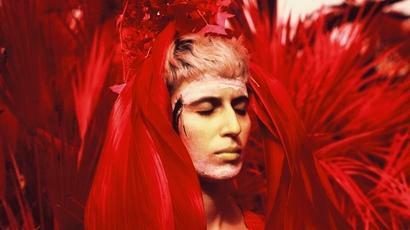 In the category of one-girl bands with a looping pedal, Surma’s performance was something to be reckoned with. Most of the acts that only have one person on stage live or die on two factors: the musician’s skill, or charisma. Charisma is not only made of verbal interaction, but also by the artist’s mannerisms on stage. While performing, Surma moves like the cutest velociraptor you can imagine, yet she’s always ready to whip out a mean guitar solo at a moment’s notice. It’s a different story with British hip-hop princess IAMDDB at nearby Platformtheater. Good beats, a soulful voice and a cheeky attitude, give off a vibe that’s both “Party time!” and introspective honesty, and it’s easy to see why she’s all the rage among the urban young’uns. Oh, how a bad crowd can dampen a good concert. IAMDDB performed to a room full of people, but the audience seemed lukewarm in giving themselves to the experience. Too bad; IAMDDB sings really well and definitely tried to engage with the crowd between songs, but failed to capture their enthusiasm. Still, nothing seems to be slowing down the rapper and she’ll be probably showing up to your 2018’s festivals to make sure you “catch a vibe”. We rounded off the second night with heavy guitars, first courtesy of French post-metallers Celeste, whose shtick of strapping lasers to their heads is just unusual enough to work well, especially accompanied by the thundering fury of their music – though the set was a bit short for music that needs a bit of time to envelop you fully. 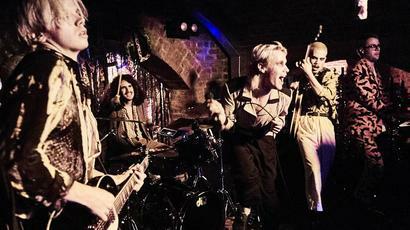 Following an intermezzo by the queer circus of HMLTD, one of the UK’s hottest acts right now – and righteously so; their avant-garde rock madness is bizarre, garish, a full-on assault on the senses, and plain fun, right up to the booming Death Grips sample –, Swiss devil bluesmen Zeal & Ardor raise the roof at Vera, inciting a mosh pit with their idiosyncratic blend of Delta blues and black metal, capping off an all-in-all great day 2 of ESNS. The final day started off shakily, with Alfa Mist’s accompanying band coming off more as a group of fresh-faced jazz academy students than a proper ensemble, and the London artist’s soul music losing some of its harmonious magic in the process. We were soon off to catch Daniel Brandt & Eternal Something, and we’re very glad we did – the ambient electronic music flowed through the stately Aa church, creating an intimate, relaxing atmosphere. Ironically, the next act we saw, again in a church and again attempting to create an enchanting ambiance, was quite the opposite. Danish black metal enigma Myrkur premiered her new incarnation, subtitled Folkesange, but rather than the malicious beauty of her folk-tinged metal output, she veered full-on into Scandinavian folk songs. Though an admirable, bold effort in theory, the result is weakly ethereal and tackily elfin, and proves to be the biggest disappointment of the festival. Tired and weary after three days and with an annoyingly early train to catch in the morning, it’s time for one last gig before saying goodbye to Groningen. The Danish Pardans at Huis De Beurs are cut from the same cloth as their compatriots Iceage, but with a smarmier, preppy attitude that can be a bit off-putting. There’s definite potential there, but they do require some more mileage, and it wouldn’t hurt them to stray a bit from their slightly formulaic combination of piercing saxophone blasts and shouty, preachy vocals over post-punk riffing. Roméo Elvis was the last surprise of the festival for me. With no Le Motel with him, the rapper brought out his DJ and gave the crowd an incredibly fierce showing of both Le Morale records that have been responsible for his breakthrough into stardom. 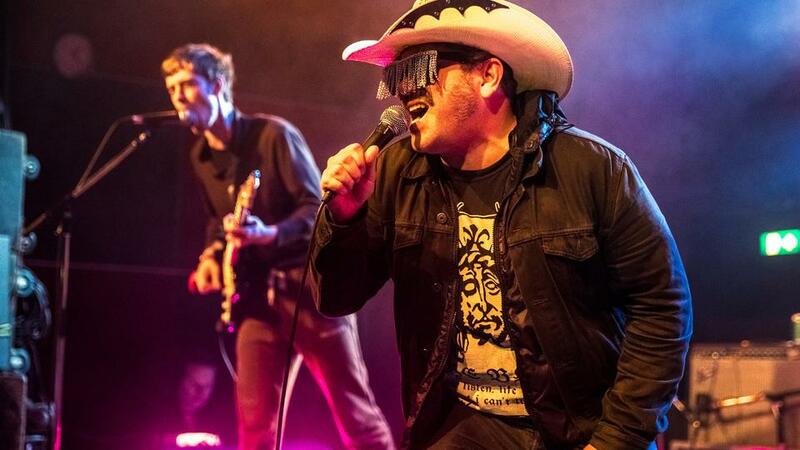 But really, it’s not just the albums; Roméo Elvis is a true beast on stage, capable of hitting every single note and making you feel his lyrics in a new dimension through his performance. A true ascending star. There, that’s how ESNS went down for Europavox – at least the parts the author remembers. Groningen, until next year. 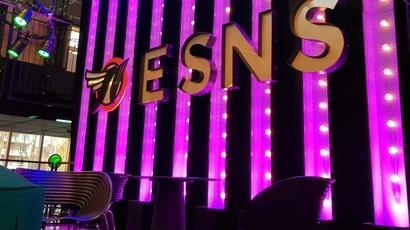 PS – ESNS also boasts a rich conference programme. You can read Amorim’s report on it here.